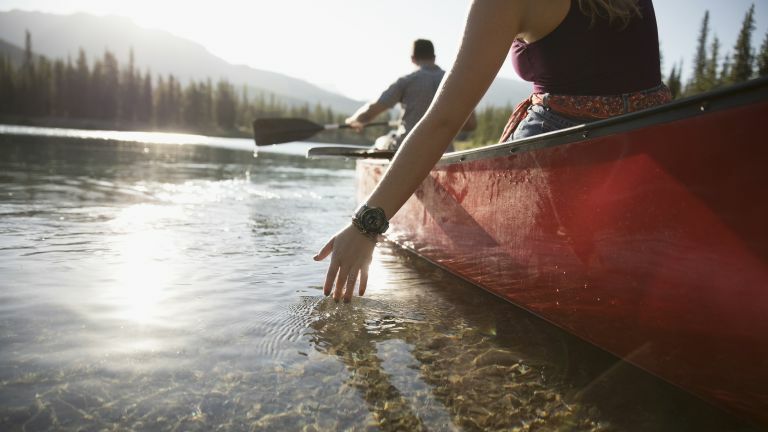 People who pick Casio wearables for their smartwatches are likely to be interested in the outdoorsy qualities on offer – rugged protection, on-board GPS – and the Pro Trek WSD-F30 is no different. It's one of the best smartwatches around for exploring the world, with or without your phone, and we've been testing it for the past week. Matching the MIL-STD-810G US military standard for durability, this is a timepiece that's going to last, and with 5-bar water resistance (protected down to 50 metres), you can take it swimming too. Not that you'd necessarily want to: all that bulk means it's not necessarily something you'd want to wear in the pool. It's a design that will appeal to some but not all, with a thick bezel, bold silver buttons, and the option of blue or orange casings if the black is a little too discreet for you. In our time with the Casio Pro Trek WSD-F30, there's no doubt that the durability of the watch is one of the stand-out features. You also get on-board GPS for finding your way home without your phone, some really clever (and info-packed) watch faces, and the usual step tracking features. It's when you're out and about that the watch really stands out. You get a compass, altimeter, air pressure sensor, and details of tide, sunset and sunrise times. The watch can even download maps for offline use when you lose signal out in the wilderness. They all work really well, though there is the occasional second of lag that we've grown accustomed to with Wear OS (the Snapdragon Wear 2100 CPU is inside). Also neat is the dual-layer design that Casio has deployed before. You have the option of switching to a more basic, monochrome display that can boost battery life from a day and a bit to almost a month – though you have to do without GPS. As an added bonus, this monochrome screen is easier to read in bright daylight. It's one of the main reasons you might pick the Casio Pro Trek WSD-F30 over something else. It's certainly comfortable, if a little heavy to wear. The thick rubber strap keeps the watch firmly attached to your wrist, but this isn't really going to appeal to those with slender wrists (even if the WSD-F30 is smaller overall than previous models). In the negatives column, NFC and heart rate monitoring are big omissions, and battery life isn't particular great. With our occasional use of the watch, we eked out just over a day of use – if you're really pushing the sensors, you won't even get that. That's not ideal if you're planning a multi-day hiking adventure. The Casio Pro Trek WSD-F30 is aimed squarely at hikers, ramblers, runners, and anyone who spends time in the great outdoors. However, we'd struggle to recommend it over its Garmin and Suunto rivals if you spend a lot of time outdoors, due to the limited battery life. As ever, the price is all important: £450 or thereabouts in the UK and $550 or thereabouts in the US. That's significantly more expensive than a lot of smartwatches on the market right now, but a little cheaper than the top-end outdoor-focused models.